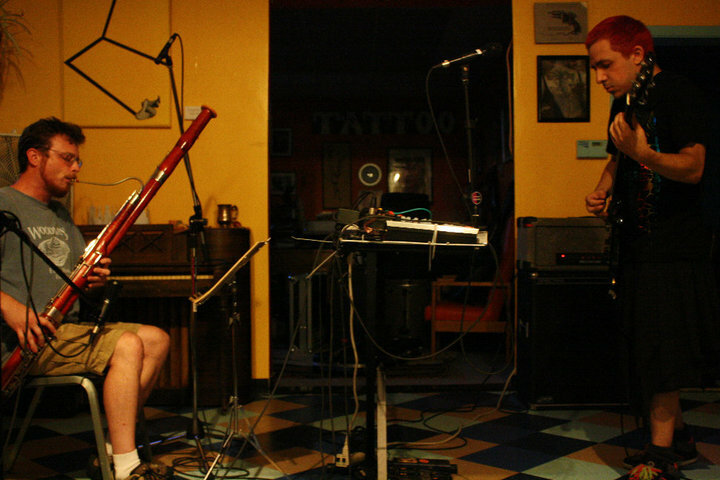 So picture this: a band featuring a DIY punker playing bass guitar, electric guitar, creating various electronic noises and vocals, paired with a classically trained bassoon player. Together they create avant-guard, complex compositions with effects heavy guitar riffs, no percussion, and a bassoon rhythm section. Sounds like a confusing mess right? In actuality, BRIAN! (which consists of Ithaca Underground main man Bubba Crumrine on guitar, bass, electronics, vocals and David Resig on bassoon) create some of the most original and interesting music I've heard in some time, while still being incredibly listenable and colorful. BRAIN! released their debut (EEE)EP on Bubba's own Pirate House records and will be performing their unique, almost unclassifiable music opening for Giraffes? Giraffes! with local act Tzar August 19th at The Shop. VII: First off, I just have to congratulate you guys on forming one of the most original sounding bands I've heard. It's not everyday that you find a bassoon player in a band these days. Bubba Crumrine +David Resig: Thanks! That really means a lot for us. We definitely strive to create something unique, to blend our influences and experience, without sounding like we're aping any one artist, group, or composer in particular. VII: How did this group form? David: Well, I started playing again after 10 years off. Bubba: ...and I said, "Whadda ya mean you play bassoon and didn't tell me?!" (Laughs) We've known each other for about 5 years or so and we both have a classical training background. Dave much more than me though. David: On top of that, I've really enjoyed listening to Bubba's music library and the bands he brings in. Oddly enough, we started off thinking it was going to be a bassoon & percussion duo. Bubba: But then I remembered I really have no percussive skills whatsoever. VII: How would you describe Brian! 's sound? I imagine that it would be kinda hard to pin down into a few adjectives. David: An attempt to blend the acoustic nature of the bassoon with the electronic and electric instruments.. Both: ..while being rooted in classical, but shedding all perceived notions of what music is supposed to be. Whew! VII: You guys recently released your debut EP. You guys recorded with Mike Stark right? What was the recording experience like? David: It was really a pleasure working with him. His attention to detail, his ear for balance, tones, and mixing is quite remarkable. Bubba: Honestly, it was awesome. He was really laid back about the whole thing, which is important to me. He was very open to the diversity of sounds we were working with and knew how to mic the bassoon well, which was a big plus. VII: How long does it usually take to finish composing a Brian! song? To the casual listener your music seems very complex and intricate. Both: Well, it can really vary. I think "An Uncommon Backstroke" (from EEEEP) came together in one rehearsal. Whereas, our latest piece, which debuted at Ithaca Festival Inside, has been at least three months in the making. It's around 15 minutes long. VII: Bubba, is getting Brain! or any of your bands in on the Ithaca Underground shows you set up on your mind a lot? Is it more a casual thing, like when it's been a while since you've performed and you feel like doing a live show, or sometimes you can't find a more avant-gard band like Brian! that would fit into a particular line-up? Bubba: Booking my own bands is something that is very much on my mind when setting up Ithaca Underground shows. There are bands I enjoy and I want to open which is part of it, but Brian! and Genital Holograms were created in part to help support shows where the crop of local bands we had at the time didn't really fit. On the flip side, I don't want IU to be touring band + Bubba's band all the time. That would take away a chance for other very capable musicians to have their place to shine. It's a tough balance to feel that I'm providing equal performing opportunities. I'd also like to play more shows outside of IU. Collaborating with Popcorn Youth and Michael Stark locally for shows with Brian! and playing Blot Spot in Binghamton with Genital Holograms was a lot of fun. It can be a bit stressful to run a show and perform in one night. VII: Do you think it's an artists duty to create music that is new and original? In this day in age with dime-a-dozen pop rock groups, it seems like the industry needs a heavy increase in original, creative bands. Bubba: I without a doubt think it's an artists responsibility to keep things moving forward. Being on the front line of dozens of requests from touring bands on a monthly basis, it really gives you a deep look into how many bands out there sound very close to one another. It's fun to create music based on what you grew up on or your favorite band, but the overall percentage of bands in the industry that take up that role seems well out of balance to me. David: Creating new music helps keep the soul alive, and helps us all progress. I think that there is a time and place for recreating other people's music; certainly, in the classical realm. Yet that genre places too little emphasis on new music. Even the pop-rock world seems to be trending towards either recreating previous sounds, or making one amalgamation. Bubba: Overall, I hope that the broader public will celebrate new things, rather than shun them. There is a glimmer of hope in the number of bands trying to progress things that are rising to popularity today. Hopefully, that trend will continue.